If you’re looking to maximize storage in your facility, an automated deep lane pallet storage system – such as the SSI Schaefer Orbiter System – provides efficient high-density storage in a safe environment. 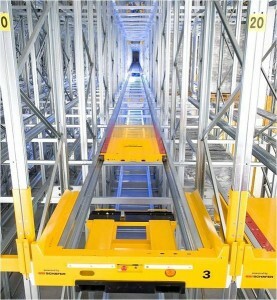 Automated pallet storage systems consist of a shuttle vehicle, docking station and specially designed channel storage. These types of material storage systems offer greater capacity than a traditional drive-in storage system by using an electrically driven trolley that runs on rails below the pallets. Using radio frequency controlled orbiters, it provides a far more efficient and cost-effective solution than traditional racking systems, and can be operated in either FILO (First In Last Out) or FIFO (First In First Out) modes in excess of 20 pallets deep. Here’s how this material storage equipment works: the docking station and the shuttle vehicle (orbiter) form a single unit that can be moved around the warehouse. Racks in which the shuttle operates have a centring console fitted onto the front. A forklift then picks up the docking station, including the orbiter, and places it into the centring console of the designated rack. The forklift then starts storage operations by placing inbound pallets on the orbiter. While the forklift attends to the next pallet to be stored, the orbiter transports the pallet quickly and safely to its desired storage location within the rack. Movement commands are given to the shuttle vehicle through a wireless remote control. is also suitable for cold storage. Furthermore, you acquire a complete solution from one single source: All standard system parts, such as racking technology, shuttle vehicle and safety components are manufactured in Schaefer production facilities. 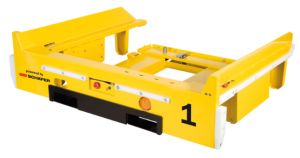 System Independence The SSI Schaefer Orbiter System can be used with every conventional fork lift, allowing companies to continue to use the existing material handling fleet at their warehouse or distribution center. The impressive hand remote is easy and clear to operate as well as being robust for daily use. Logical and clear icons enable simple and fast operation of the system. Intelligent system with extensive operating options. 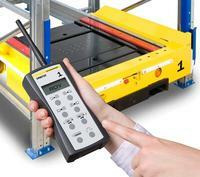 Find quality automated pallet racking systems at Outsource Equipment today!